When you think about it, in the course of human history, 100 years isn't a particularly long time. But in the course of fashion history, it's the difference between trying to get around in a bone-cinching girdle and ankle-length skirt, and the Nike leggings and Vans sneakers you might be wearing at this very moment. In the intervening years, there have been major shifts in technology, politics, culture and social norms—and fashion has reflected that in its ever-changing cycle of trends. From the sky-high platforms of the '70s to the high-waisted bikinis of the '40s, we see plenty of the most popular looks of decades past serving as inspiration for designers today. Below, take a look back at the most influential trends from the 1900s through to today (and see which ones you'd actually still consider wearing). 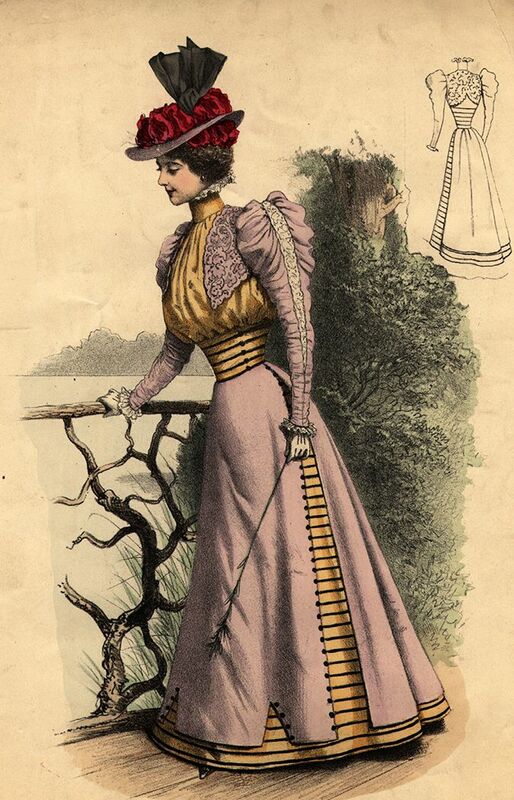 The Edwardian period saw the introduction of the "S-bend" or "health" corset, a style that altered the wearer's posture and (shocker) was no more healthful than its predecessors. Toward the end of the decade, the fashion shifted to girdles and away from the dramatic hourglass silhouettes that had been demanded of women for decades. Leisure apparel was also introduced, with options like blazers, long skirts and wool sweaters becoming part of many women's wardrobes. Flapper ensembles are instantly recognisable as the look of the 1920s, and it's easy to see why: With their relaxed drop waists, ornately beaded designs and feathered accessories, the trends of the era have enduring appeal. The most influential style, however, may have been a more subtle one. According to The Dictionary of Fashion History, it was in this decade that Coco Chanel introduced the little black dress: "It offered simplicity and elegance and, instead of being a colour associated with servants or widows, black became chic." While the American public was reeling from the Great Depression, the silver screen became a welcome site of escapism. There, film icons like Bette Davis, Jean Harlow and Joan Crawford dazzled in glamorous gowns and tailored skirt suits. The silhouette was long and lean, in part thanks to the popularization of Madeleine Vionnet's bias cut, a technique that allows fabric to drape over the body. One of the less predictable consequences of wartime was the increasing popularity of the two-piece swimsuit, a result of fabric rationing enforced by the U.S. government beginning in 1943. Three years later, French designer Louis Réard introduced the bikini we know today, naming it after the site of American nuclear tests and daring to cut it below the belly button—a style that wouldn't fully be embraced without some degree of public outcry until decades later. In 1947, Christian Dior debuted the "New Look" silhouette that would shape the decade to come: With its wasp waist, structured bust and voluminous taffeta layered skirt, it was the antithesis of wartime restraint. Even the lighter garments that eventually became common fare among middle-class women retained much of this pronounced femininity: cinch-waist dresses, full mid-calf skirts and sweater sets. Hemlines crept ever northward in the '60s, and ground zero for the shift was designer Mary Quant's London boutique, Bazaar. ''If I didn't make them short enough, the Chelsea girls, who had wonderful legs, would get out the scissors and shorten the skirts themselves,'' she later told the The New York Times. At the time, they were controversial, but clearly, the naysayers were ultimately overpowered. Additionally, two of the most popular hues of the Space Age were—appropriately—white and silver, two colour trends that were the result of advancements in fabric technology. André Courrèges's signature optical white, for instance, was enabled by the introduction of a new bleach in the late '60s, according to historian Valérie Guillaume. Jeans got wider, heels got taller and synthetic fabrics flooded fashion stores during the '70s. In New York, Halston's coterie of Studio 54–dwelling cool girls brought disco trends like Lurex halter tops and palazzo pants to the mainstream, while on the other side of the Atlantic, the punk scene thrived, led by Vivienne Westwood and Malcolm McLaren in tattered T-shirts and safety-pinned tartan. If there's one item that was as ubiquitous in the '80s as it is today, it's leggings. Alongside the aerobics craze of the decade, Spandex became a bona fide fashion trend—though back then, they were worn with leg warmers, off-the-shoulder sweatshirts and/or scrunchies. For more professionally minded women, the broad-shouldered power suit became an office staple—and for good reason. As historian Bonnie English writes in A Cultural History of Fashion in the 20th and 21st Centuries, "Women in professional careers used fashion as a political language to illustrate their expectations of power and position in the management structures of large corporations." If you were going to be shattering the glass ceiling, you might as well be wearing shoulder pads. The youth-oriented culture of the "Smells Like Teen Spirit" decade was fertile ground for grunge to take hold, as it did following Marc Jacobs's groundbreaking S/S 93 collection for Perry Ellis. Teens and 20-somethings embraced baggy trousers and floral prints—and still, today snap them up in vintage stores. Elsewhere, minimalism became big news in fashion, with slip dresses, sheer fabrics and a palette of black, grey and white ruling the runways. Finally, hip-hop's influence extended to the mainstream, with the MTV generation copying looks they saw on artists like TLC, Aaliyah and Salt-N-Pepa. With six and a half years of the decade behind us, we feel safe in our predictions as to which trends will endure most over time. Skinny jeans came into their own this decade after gradually making their way into the mainstream, and despite endless articles heralding their death, they're not likely to be going anywhere anytime soon. Same goes for athleisure (and, to a smaller extent, it's more ephemeral cousin, normcore): Now that we've experienced the joys of walking around in sneakers, tees and hoodies all day while still looking stylish, who would want to go back? Next up, the £5 handbag creating a buzz in fashion circles.